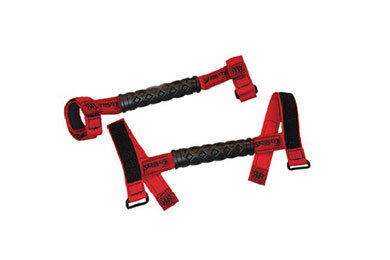 Skyjacker RRGH30-K - Skyjacker Rock Ready Grab Handles - FREE SHIPPING! They work well in the Jeep. I got them fast and easy. Excellent fit, look real good, and feel good in the hand. They work great! A must if you have a lift on your jeep. Since I have a red jeep I bought the red ones to match. Buy the larger ones if you have a TJ. The smaller size will not fit!! I had to return the smaller size. Used the large size to fit around the pads on my '13 JK. Gives the kid something to grab on to and pull himself up. Functional, affordable and just flat out looks good! Fantastic look and feel. Easy installation. Appreciated by passengers. they look great and make it easy to get in and out of my wrangler. Purchased the larger ones for my 09 Wrangler to fit over the rollbar pads. They couldn't be easier to install - took 30 seconds. Great product. the is a nice, functional item- my wife loves it for getting in and out of the wrangler, seems well made, looks cool! The handles work really nice. Now my kids can grab onto something when trying to climb in my Jeep. These Skyjacker Rock Ready grab handles are a very good fit for my '06 Jeep Wrangler. I had orderd another brand from an on-line store, but the quality of these is much better. Thanks, Skyjacker and thanks AutoAnything for shipping so quickly !! I bought these a few years ago for giving my wife a little boost in, and for having something to rest on when the doors are at home. Now it's my standard Jeep-warming gift for noobs. Amazed at how well they say put, they don't slip or slide when used. My daughters especially like them getting in and out of our JEEP. Superb quality. I bought 2 sets of the 3&quot; handles for my 2003 TJ. They fit perfectly in the back, because the factory roll bars are thicker in the back. On the front, the straps are about 1.5&quot; too long, making me think that the 2&quot; version of the handles might have been a better choice for the front roll bars on my vehicle. Reference # 762-380-160 © 2000-2019 AutoAnything, Inc.